Photograph courtesy of Beau B via a Creative Commons license. Beverages like soda, sports drinks and energy drinks are loaded with sugar and empty calories. Soda is the number one source of added sugar in the American diet, which isn’t surprising since a 20-oz bottle of soda contains about 17 teaspoons of sugar. 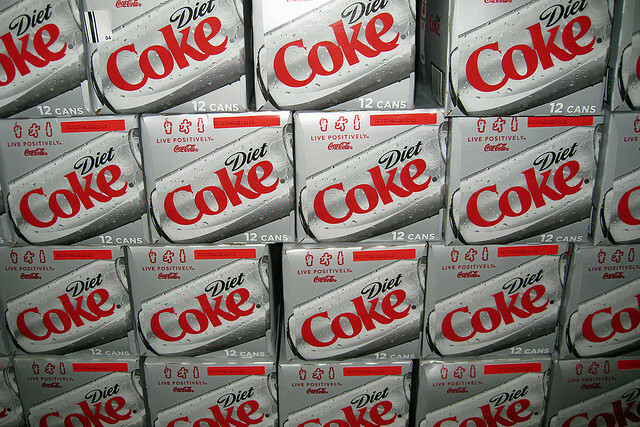 So it makes sense that overweight people often turn to diet drinks to help them slim down. But recent research suggests that this weight-loss tactic may backfire. In comparison, healthy-weight diet drinkers ate less food calories – 73 less calories per day – than their counterparts who drank sugar-sweetened beverages. Further research is needed to understand both the biological and psychological response to regularly drinking diet beverages with artificial sweeteners. But it is clear that you aren’t going to drop pant sizes by simply switching from Coke to Diet Coke. You be the judge! Help pick the next big tech idea that will benefit society. Five scientists will pitch their technology ideas at the next Science at the Theater, a free public lecture hosted by Lawrence Berkeley National Laboratory. It will be held on Monday, February 24 at 7 pm at the Berkeley Repertory Theater. Free reservations for the event are still available. But hurry, because these events usually fill up. It isn’t too late to sign up for an upcoming Expanding Your Horizons conference. These conferences are designed to inspire middle and high school girls to careers in science, technology, engineering and mathematics. The girls participate in fun hands-on activities led by women role models. For instance, they can spend the day building lego robots and participating in a robot demolition derby. There are also workshops for parents, including discussions on how best to support your daughter throughout her schooling. UC Berkeley’s Expanding Your Horizons conference will be held on March 15, 2014 and registration is still open for girls, parents and volunteers. There are also conferences at other Bay Area locations in the spring and fall.